If there’s one thing to take away from both John Wick movies thus far, it’s that if you ever come across a situation that requires you to somehow anger a retired hitman version of Keanu Reeves, whether it be steal his car, kill his dog, or in this case blow up his entire house, it’s probably best not to do it at all, because his retaliation will be swift, merciless, and extremely bloody. 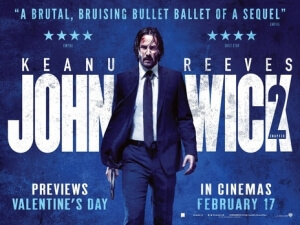 This cautionary tale extends from the first breakout action hit back in 2015 (or 2014, if you’re in the US), and into the kinetic sequel John Wick: Chapter 2 which, like its predecessor, is at once a marvellously entertaining action film and also a stunning world-builder that gives us more of a glimpse of the fascinating world of assassins that respective director and writer Chad Stahelski and Derek Kolstad have created. We open up on John Wick (Reeves), the formerly retired hitman who has just gotten revenge on the Russian mob after they killed his dog, now in the midst of retrieving back his stolen car from a cameoing Peter Stormare, and this opening sequence alone sets the standard for how insanely choreographed and pleasurably loud these action scenes can get, including everything from fist fights to gun play to hitting people with cars; it’s absolutely astonishing to watch. But once all that’s taken care of and before he can finally rest, Wick is visited by an old associate (Riccardo Scamarcio) who wants him to pull off an assassination that would effectively give him power over an international assassin’s league. When Wick understandably refuses – seriously, if you’d just gone through the stuff he went through in the first film, you’d pine for some time off, too – the associate blows up his house in retaliation, leaving Wick no choice but to return to the fold once more, and put himself right in the crosshairs if he is to exact vengeance on the guy who keeps screwing him over. While the plot is a basic “bigger and better” upgrade of the one from before, there’s enough new stuff here to keep you fully interested in where this is all going to go – and no, there are no more dog murders this time, which should relieve any and all puppy lovers out there – and a lot of that is down to how this world, introduced in the first film, is expanded upon. We get to see how this empire of assassins has gone international, and like in the first one you find yourself wanting to know a whole lot more about how it all works, and the numerous quirky characters that inhabit it. It appears that this entire world is half-populated by freelance killers, which makes things all the more interesting when literally anybody could be hired to kill you, whether it be a couple walking in the park, or a violinist playing in an underground subway. This kind of world-building is usually reserved for the best sequels of any kind, and here it gives you just enough information to leave you satisfied while also wanting considerably more. You have to admire writer Kolstad’s imagination for the levels of detail that have gone into designing each aspect of this world, from the numerous hotels for assassins around the world, to the currency they use (which appears to consist mainly of golden doubloons), to the numerous characters who each have distinctive personalities and job titles that really make you want a whole lot more of them, whether it be in another film or – even better – an ensemble TV show that fleshes them out further. But director Stahelski has imagination too, which he converts into visual action sequences that are not just fascinating to watch, but also worth studying for any budding fight choreographer out there, because these are some next-level punches and kicks they are pulling off here. Whether Wick is shooting people in the head, or engaging in full-body combat, or doing stuff with a pencil that would make even The Joker gasp with fright, it’s all directed like a ballet; elegant, smooth, and with such grace it’s kind of beautiful. One of the strength of both these movies has been their eye for bloody but artful action, and Stahelski ensures that the audience is able to see as many frames of it as possible with impeccable camera work and careful editing – in fact, it’s quite astounding for an action movie nowadays to have an extended sequence with people running and shooting at each other in a dark underground tunnel, and STILL have it be easy to figure out what is going on. The action truly is an art-form in this film, and when you have a guy like Reeves who even at the age of 52 is still active enough to believably kill so many people, it’s made even better when you know it’s mostly him doing these crazy stunts, and not someone who looks like him and is also in better physical condition. Both films thus far have been truly awesome in their ability to mix stunning fight choreography with a fun script that creates this vast universe you desperately want to know more about, and by the time this film ends you are already pining for a Chapter 3, because your curiosity for where this is all going to eventually end up is just so overwhelming it hurts. But for now, John Wick: Chapter 2 continues the breath-taking saga of a hitman nobody in their right mind would dare cross, which is made all the more amusing when you remind yourself that everything in these movies happens because his cute little puppy was killed. If that doesn’t make for the greatest PETA advert ever, then nothing will. John Wick: Chapter 2 is a stunning action sequel that perfectly blends exhilarating and sometimes beautiful fight choreography with an entertaining story that successfully builds upon the world introduced in the first film, with far more engaging and intriguing results than its already-awesome predecessor.